There are more than 700 registered hotels in Beijing, according to the Beijing Tourist Agency, but among these only a handful offer guests an experience of old Beijing. Many foreign visitors, who want the opportunity to stay in a hutong but not forgo luxury, are opting for renovated courtyard houses, or siheyuan. According to Jiao Lei, manager of Zhong Tang Hotel, a converted siheyuan hotel located in Xisi Bei’ertiao Hutong, some of their guests are Chinese, but the vast majority are foreigners. “Many of the Chinese people who come to Beijing, come from the south of China,” he told METRO. Foreigners seek out the siheyuan for the very opposite reason. 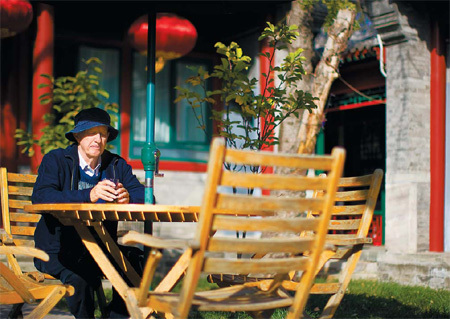 “I didn’t want to stay in a big hotel with all the marble and the rooms,” explained 70 year-old Stephen Lesser, a retired film professor from Los Angeles staying at Sihe Courtyard Hotel in Dengcao Hutong near Dongsi Nanxiaojie. Walking through the bustling, labyrinthine streets of Beijing’s traditional neighborhoods gives a sense of the city’s history. But living in a siheyuan, even if only for a night or two, is a great way to penetrate the gray walls and learn the history from within. According to Sihe Courtyard Hotel’s owner, Su Zhiwei, the three courtyards that make up the hotel are loaded with history that stretches all the way back to the Qing Dynasty (1644-1911). One of them has been in his family for three generations. Another, said Su, was the home of Wang Yuhua, an officer from the Qing Dynasty, and Liao Yaoxing, a commander of the Kuomintang. The central courtyard was also briefly the residence of renowned Beijing opera artist Mei Lanfang during the 1940s. After getting into the hotel business in Dalian, Su came to Beijing in 1989 to transform his family’s siheyuan into a hotel, and worked to incorporate neighboring properties to expand it. If you visit this website, you will read about how, Su began reconstruction in 2004, and after investing 5 million yuan into the project, opened Sihe Courtyard Hotel for business in 2006. The result? King-size canopy beds, antique Chinese furnishings and artwork that manages to create a cozy space, with a giant flat screen television artfully placed for a hint of 21st century decoration. The VIP suite is the priciest room at 1,080 yuan a night and the standard room will set you back 740 yuan as the cheapest option. Both put themselves well in the range of Beijing’s four- and five-star hotels in terms of quality and affordability, but with that little bit extra. At Sihe Courtyard Hotel, breakfast is served in the dining room and everyone eats together. Now that’s a sense of the real Beijing. This entry was posted in Travel and tagged Beijing, Expats, Hutong hotels. Bookmark the permalink.